Back in Georgia a clothesline is a function of living. When we moved to Virginia and into Steve’s townhouse clotheslines were not allowed. Yeah, home owner’s associations make no sense. When we bought this house there was a clothesline. Not the best, not the most useful but it was there. A line tethered from the grill house to the tobacco barn. When we decided to build the swimming pool it had to come down because it was running right through the deepest end of the pool layout. From then on every spring and summer I asked for a new clothesline. The person who I felt sure would put me up a line never did. The deer caught in the headlights look always met my request. Out of necessity I started putting the clothes on hangers straight from the washer and hanging them along the main stretch of the back fence. It worked but a strong wind would blow them off and sometimes the fence left a powdery imprint on the clothes. It became such a point of contention that hanging out the clothes last fall made me angry. Just angry. I knew I had to do something for this spring and I knew what kind of clothesline I wanted. Then the snow and ice came and I completely forgot about my lack of a proper clothesline. When I finished the raised bed project I had these timbers left over and there were two 2×3’s from the greenhouse still leaning under the awning out of the rain. I looked at them a few times and wondered what I could do with them. It was about 2am when I woke up knowing exactly what I was going to do with them. 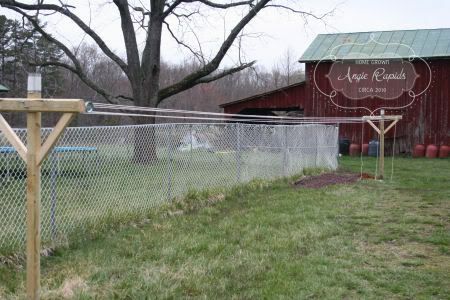 I decided I would build my own clothesline. 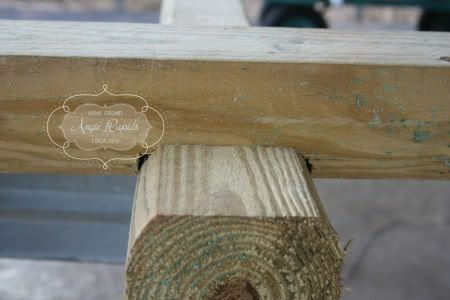 These treated timbers are approximately 3 1/2 x 3 1/2 x 8. 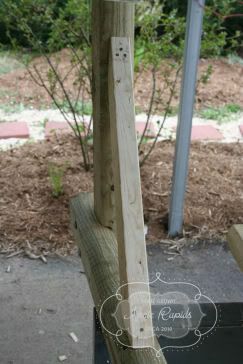 I decided to use them to construct the T post to support the drying lines with pieces cut from the 2×3 lumber as the support arms. 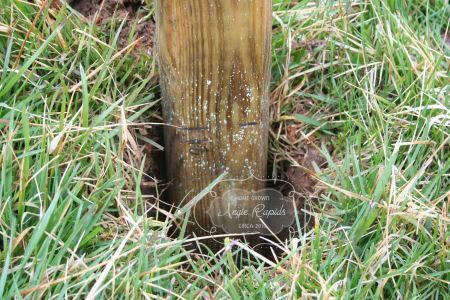 First I measured 2 feet from the bottom of the post (the end I planned to put into the hole in the ground). I marked this off on both posts. 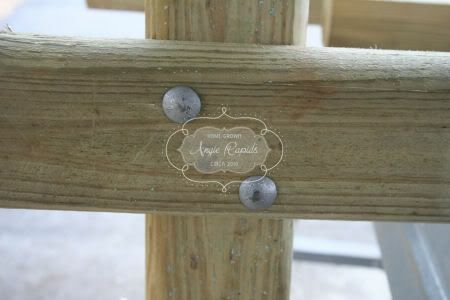 Next I measure 4 inches from the top of the post and marked this. 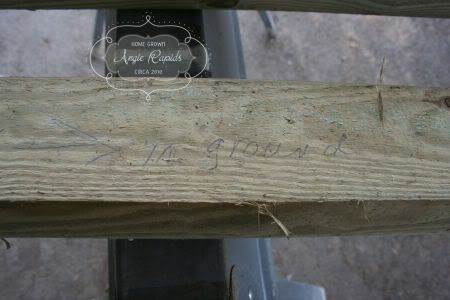 Then I measure 3.5 inches below this mark and marked it on both posts. Next I cut two 42 inch lengths of the third post to use as the cross T. I located the center of this piece then marked the exact width of my post. Both of the areas I planned to notch so that fit together snug with good support. The wood chisel is sharp. Very sharp. It will cut right in to the wood with a tap of the hammer. I worked carefully on both pieces until I had notched out about half an inch on both pieces. Then I checked the fit. I wanted them to be snug and tight and pressed together completely. 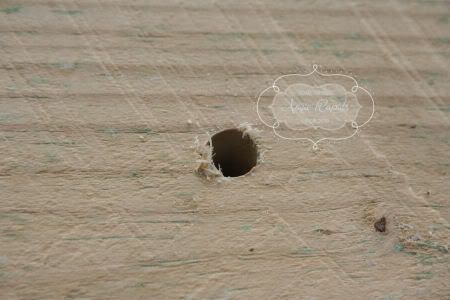 Next I drilled two holes through both pieces as they rested together. 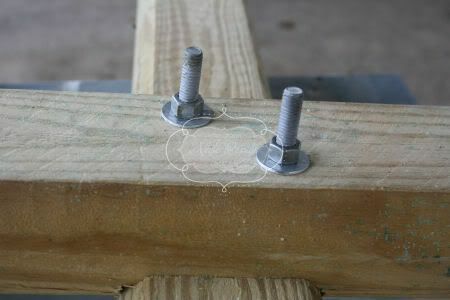 I tapped a bolt through each hole making sure that the heads of the bolts where on the post side. Rolling the post over I secured each bolt with a washer and a nut. It is important that the end of the bolts be on this side of the arms. Once the lines are strung you want the force pulling the cross T into the post with the post as your resistance. 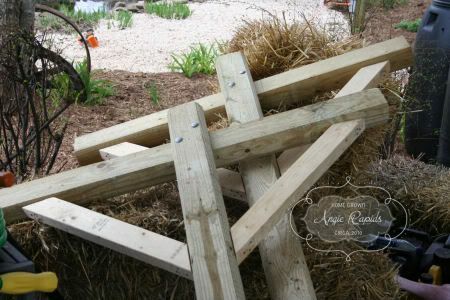 If you turned it around the other way the lines and weight of the laundry would always be pulling the cross T away from the post and over time the arm would weaken, the bolts would loosen and eventually it would sag and no longer be a strong sturdy line. 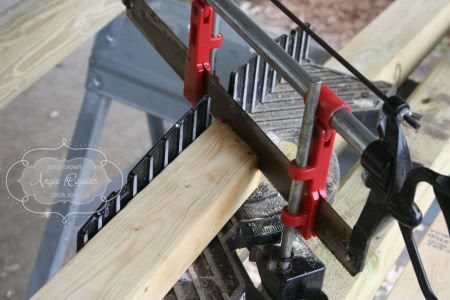 Also with the bolt ends facing out you are never in danger of cutting or scrapping your hands on the exposed ends as you work with the lines and hanging laundry. Next I used a miter box and saw to cut the arms that would support the weight of the cross T. I measured four 2 foot lengths and cut 45 degree angels on each end. Thanks to Evelyn Shepperd and 10th grade geometry I didn’t even have to stop and think about what degree the angel should be cut. See that gorgeous triangle? W00t! 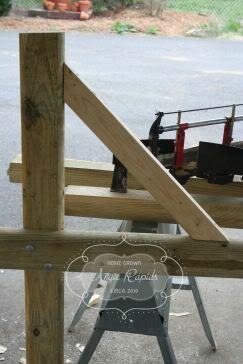 I used nails to secure the supports to the post and the cross T.
I worked through each side until I had both posts finished. It took about 4 hours to do this part of the project. This includes set up of my workspace, clean up of the area, lunch for Steven, a phone call and a FB update while I waited for Steven to make up his mind if was going to come back outside (it was cold!) or stay in by the fire and watch GI Joe on Hub. GI Joe won and I finished out the project alone. With rain in the forecast I really wanted to get those posts in the ground but it did not work out the way I planned. The rain came cold and quick so I had to wait until the following morning to dig the holes. 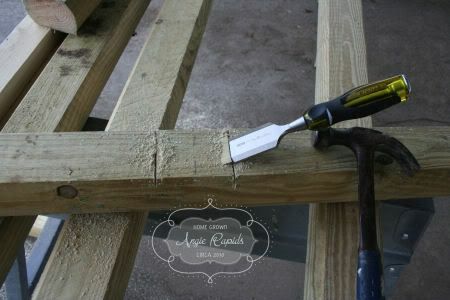 I had to dig the holes manually – that was a real work out!! 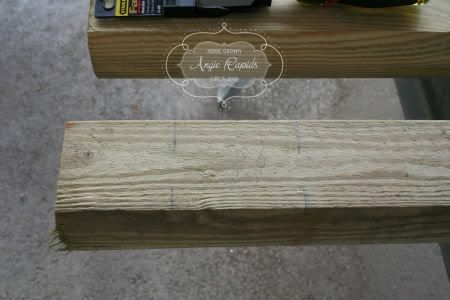 I used a leftover piece of timber marked at 2 foot to measure my hole depth, a level to make sure my posts where straight and quikrete to anchor the posts in the ground. 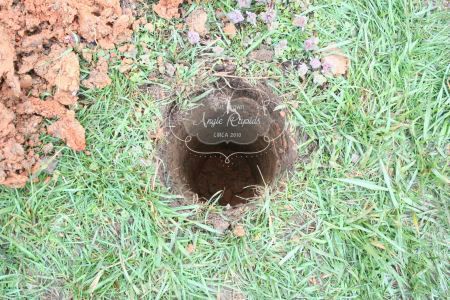 A 2 foot hole is much deeper than you can imagine! 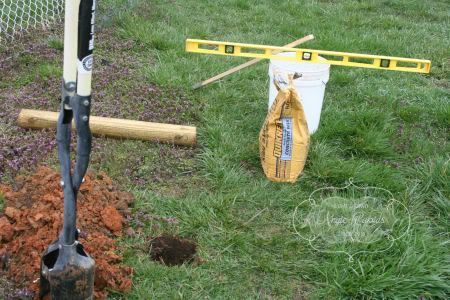 It is very important that the posts be put in the ground as deep as possible. 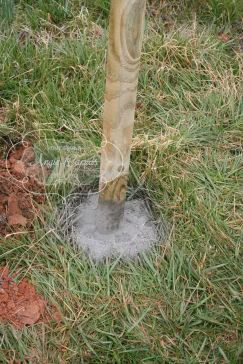 Weather and temperature changes can cause the earth to heave those posts up. My posts are 8 foot leaving me with 6 foot above ground to work with. 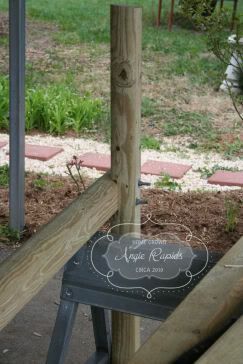 If you are in a sandy area you would need to use 12 foot posts and sink them much deeper – 3 to 4 foot deep each. Bags of quikrete are heavy! This is an 80lb bag and I could barely handle it. If you do this I suggest two 40lbs bags instead. 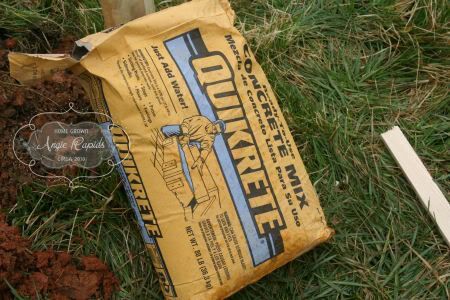 Quikrete is a ready mix cement. You don’t have to do anything to it but add water. If your ground is very dry it will pull the water out of your quikrete. When you dig your hole and your ground is dry wet the ground in hole. Spray it with the hose all around the sides and bottom. 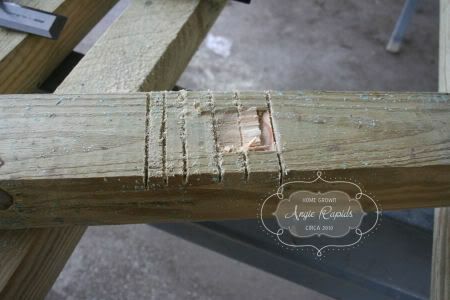 Once I set my post into the hole I poured in a bit of the mix and used a stick to tamp it down tight around the post. Then I used the level and made sure the post was straight. Next I filled the hole about one third of the way tamped it down tight, sprinkled in a tiny bit of water to get things going then added another layer of cement mix. I repeated the process again and filled the hole to the top. I tamped everything as compacted as possible. With the rain coming and amount of moisture in the ground I did not wet the top of the quikrete as it is exposed at ground level. I waited and let the rain and gravity do that work for me. It took me about 25 minutes to dig that first hole. That end of the ground was filled with hard packed clay and rocks. The second hole was easy. It took only about 15 minutes to work down two feet. The quilrete needs 24 to 48 hours to cure. Give it time to set up before stringing lines. I had saved the cans from kidney beans when I made chili knowing I would find a use for them. Instead of purchasing a post end cap to keep the rain from settling on the post and eventually rotting down into it I used the cans as the post caps. It works. You’ll see this done at many old farms along fence lines. 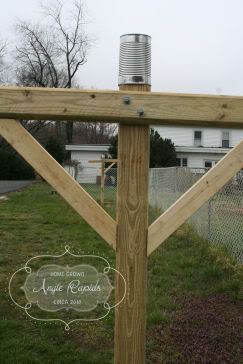 The fence posts will be sporting a tin can cover. I like the way it looks. Colby thinks it is ghetto fabulous. Whateveah! 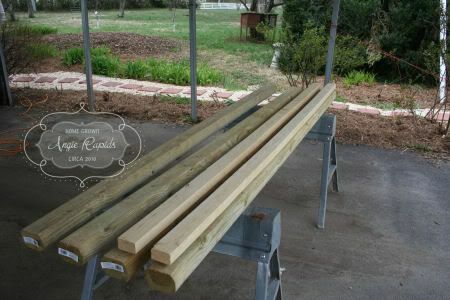 I had wanted my hardware to be installed before I set the posts but FedEx did not bring my items on time and I really needed to get those posts in the ground while it was raining. 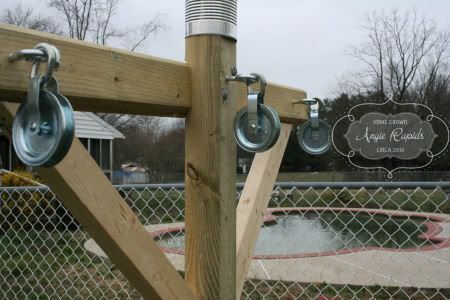 For as long as I can remember I have wanted a clothes line with pulleys. Just something left over form my childhood that I thought was fabulous and deemed one day I would have. Since I was building this one myself I indulged my dreams. I could not find a galvanized pulley in my local shop and what they did offer was more than I wanted to pay. 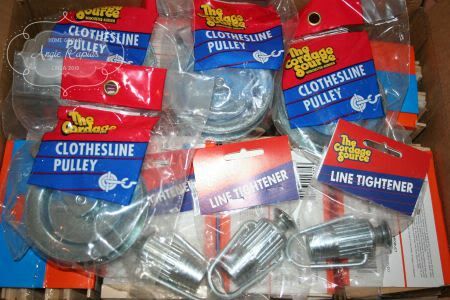 So I ordered pulleys and line tighteners online and had to wait for them to be shipped. I picked up at my local hardware store the eye screws and the linkage to connect my pulleys to the eyescrews. The links are actually links for chain that come open and you have to pound them closed. They were much less expensive than other linkage options and I didn’t have anything already on hand that I could use. This is my own pulley assembly. You don’t have to use pulleys. You can install the eye screws and hang your lines from there. I chose to indulge myself in something more. I drilled 3 equally spaced holes on the cross T’s. 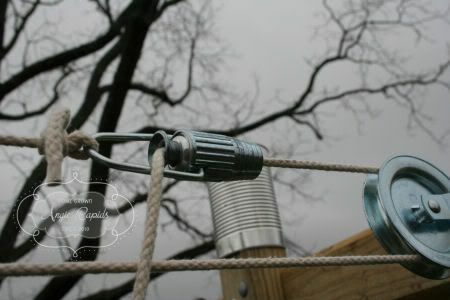 In the cold drizzle of the late afternoon I worked with cold hands and installed all six pulley assemblies. Next I ran 3 lengths of cotton clothesline. 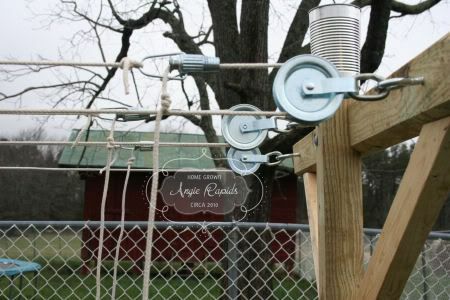 I chose cotton over the plastic coated wire that is now offered for clothesline. I just don’t like the wire and it won’t work well with my pulleys. No matter what the package says a cotton clothesline will stretch and relax over time. The weight of wet clothes will pull it down and make it sag. For months after there will be the need for pulling up sagging lines. Unless you install line pullers. These grip the lines when you pull it tight to remove the slack. It locks in tight with the use of springs and bearings and the line will not pull back through. Once it is tight it will stay tight. Simply tie off one end on the loop then feed the other end through the device. When you tighten the line make sure you put a knot or two in the tail piece and cut off the leftover length. Next up? A sunny day and clothes pins! 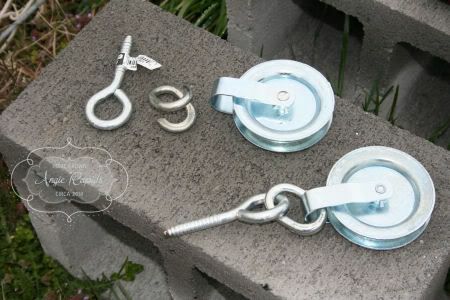 6 pulleys @ $2.76 each = $16.56 – I chose galvanized pulleys and not the plastic ones at my local hardware. The plastic will degrade over time. In the deep winter of ice and snow they will eventually crack and need to be replaced. 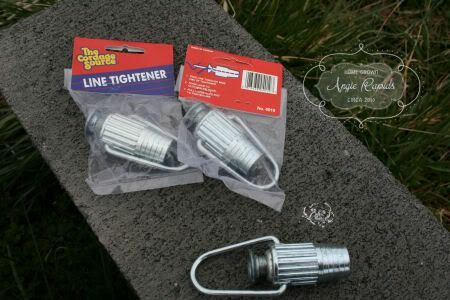 3 line pullers @$2.56 = $7.68 – Kudos to the person who invented this! It works excellently! 6 eyescrews @$1.49 = $8.94 – I used the ones rated for 190lbs. 6 chain links @.49 = $2.94 – Thanks to Beverly at the hardware store for pointing me in a less expensive direction when I was in there looking for linkage. 3 cotton clothesline $5.79 = $17.37 – Old fashion choice that makes me very happy. I think this summer I will easily cut my electric bill by using the clothesline. It will certainly pay for itself over the spring, summer and fall. This is certainly a doable project for us ladies. If you need a new clothesline go ahead and do it yourself. I think you’ll be far more pleased with your own work and skills as you hang your laundry out on a sunny day. I have one more upgrade planned for my clothesline. 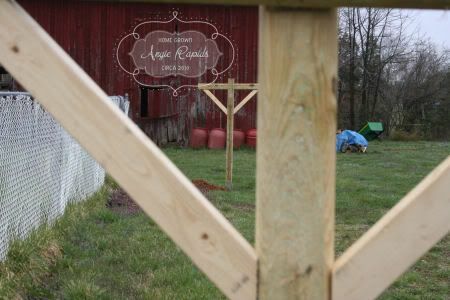 I intend to plant lavender in raised beds at either end of the posts. Don’t you love the way your sheets and clothes smell when you bring them in off the line? I do! It’s a shame you don’t have a donate button! I’d most certainly donate to this superb blog! I suppose for now i’ll settle for book-marking and adding your RSS feed to my Google account. I look forward to new updates and will talk about this website with my Facebook group. Talk soon! use a little something from other web sites. I so appreciate your detailed instructions on how you built your clothesline. Our clothesline poles (left by a previous tenant) were not made with treated wood, but lasted us over eight years before rotting at ground level WITH full lines of clothes attached. 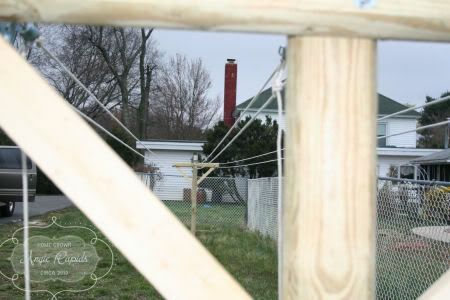 So I researched clothesline poles to buy (cheap quality from China) and decided I wanted to build something with character that would last a long time. Thank you again for putting so much effort into these instructions. They were super helpful. Very good blog you have here but I was curious about if you knew of any message boards that cover the same topics discussed in this article? I’d really love to be a part of group where I can get feedback from other experienced individuals that share the same interest. If you have any recommendations, please let me know. Appreciate it! Wow that was unusual. I just wrote an really long comment but after I clicked submit my comment didn’t appear. Grrrr… well I’m not writing all that over again. Anyhow, just wanted to say wonderful blog! In the awesome scheme of things you actually get an A for effort and hard work. Where exactly you actually misplaced me personally was in your details. As it is said, the devil is in the details… And it couldn’t be more true at this point. Having said that, allow me inform you just what exactly did work. The article (parts of it) can be very convincing which is probably the reason why I am taking the effort in order to comment. I do not really make it a regular habit of doing that. Next, although I can easily see a jumps in reason you come up with, I am not sure of how you seem to unite the details which in turn help to make your final result. For now I shall subscribe to your issue however trust in the foreseeable future you link your facts better. There are extremely a great deal of details this way to think about. Which is a excellent denote raise up. I supply the thoughts above as general inspiration but clearly you will discover questions including the one you raise up the spot that the most significant thing might be in honest very good faith. I don?t know if best practices have emerged about things like that, but Almost certainly that your particular job is clearly recognized as a reasonable game. Both little ones notice the impact of a moment’s pleasure, through out their lives. Almost all of what you point out happens to be astonishingly legitimate and it makes me ponder the reason why I had not looked at this in this light before. Your piece really did turn the light on for me as far as this specific subject goes. Nevertheless at this time there is actually 1 point I am not really too comfy with and whilst I try to reconcile that with the actual central theme of the position, permit me observe what all the rest of your visitors have to say.Well done. It’s a shame you don’t have a donate button! I’d without a doubt donate to this fantastic blog! I guess for now i’ll settle for bookmarking and adding your RSS feed to my Google account. I look forward to brand new updates and will talk about this site with my Facebook group. Chat soon! every month because you’ve got high quality content. I needed to send you that very little note to be able to give thanks yet again just for the fantastic things you’ve provided on this page. It is really generous with you to deliver freely what a number of people would’ve distributed for an e-book in order to make some cash for their own end, and in particular seeing that you might have tried it in case you considered necessary. These strategies as well worked as a great way to fully grasp that someone else have similar desire just like my personal own to realize good deal more regarding this issue. I know there are numerous more enjoyable periods in the future for folks who start reading http://pusnews.com. truly excellent data in support of visitors. After research a few of the weblog posts on your website now, and I truly like your way of blogging. I bookmarked it to my bookmark website checklist and can be checking back soon. Pls take a look at my website online as well and let me know what you think. Thank you, I’ve recently been searching for information about this subject for ages and yours is the best I’ve discovered so far. But, what about the conclusion? Are you sure about the source? Thanks , I’ve recently been searching for information about this topic for a long time and yours is the greatest I’ve found out till now. However, what about the conclusion? Are you sure concerning the source? hey, great website keep up the good work. Simply wanna comment that you have a very decent web site , I like the design it actually stands out. I really like reading through a post that can make people think. Also, many thanks for permitting me to comment! Very good topic to learn. I am a hardware technician. And after reading the writing from you, I got many valuable lessons. Thanks. Continue writing good topics. You are my aspiration, I have few web logs and very sporadically run out from brand :). “Never mistake motion for action.” by Ernest Hemingway. Its wonderful as your other blog posts : D, thankyou for posting . “You can’t have everything. Where would you put it” by Steven Wright. I do believe all of the concepts you’ve presented in your post. They’re very convincing and will certainly work. Nonetheless, the posts are too quick for starters. May just you please extend them a bit from subsequent time? Thank you for the post. F*ckin’ amazing things here. I am very happy to see your article. Thank you a lot and i’m having a look ahead to contact you. Will you please drop me a mail? Fantastic website. Plenty of useful information here. I am sending it to a few buddies ans additionally sharing in delicious. And naturally, thanks to your effort! Personally I dont like marijuana (as far as getting high) but I do take CBD! They have lots of different ways of taking marijuana/hemp products that dont involve getting high! Just want people to realize this fact. It has many marijuana/hemp has medical benefits beyond the “high”.. I take cbd daily by tincture. Heres an example: https://cbdfx.com/collections/cbd-tincture/ if anyone is interested. However there are lots of ways to benefit from the marijuana plant without getting high. I guess that’s just my little public service anouncment haha. My eyes are on that prawn instead. So many prawns but I really can finish up them on my own. Hehehehe. Come Visit My Farm Store on Etsy. eReader.com ebooks for your Blackberry. You don't need a Kindle or a Sony reader if you have a Blackberry. Upgrade to a 16GB micro SD card for more storage options. Steve: Mom broke the Internet. Gracie: On My Machine too?!? Steve: No, your copy of the internet is still working on your machine. Disclaimer: All items have been collected by me or made by me for the purpose of any give away. No item is sponsored or donated by a third party. Join me in November for National Novel Writing Month. Add me to your buddy list! Thank you for your generous donations to the rescue fund for Jack and Diana. Both of these wonderful Percheron horses were saved from the kill pens of slaughter auctions. Jack is recovering from a severe leg injury and has many more months to go before his wounds are healed. Diana could barely walk on her broken hooves. With extensive and expensive farrier work she is now standing tall and without pain. She has at least a year ahead of her before her broken hooves will grow out to become healthy new feet to stand on. Her treatment will require ongoing farrier work expected to total into the thousands of dollars. Jack and Diana both need a few hundred pounds on their bodies to be back in good health. Through your generous donations and support Jack and Diana can expect a full return to their good health and sound footing. My daughter's senior trip donation fund is now open. Thank you for contributing to her trip to visit England, Wales, Scotland and Ireland. Donation accepted through paypal. Put some chickens in your backyard. Everything on this website belongs to me. Please do not take things from me. If you would like something please ask first. Otherwise you are a theif.